Simple, handmade valentines can go a long way toward generating joy, especially among young cancer patients who are hospitalized and may miss out on exchanging cards with their friends and classmates. GCU enrollment counselor Marissa Rutherford and her daughters, from left, Ava, 7, Jordan, 6, and Callie, 9, created Cupids for Kids!, which generated 600 handmade valentines to be delivered on Valentine’s Day to hospitalized children with cancer. That’s what crossed Marissa Rutherford’s mind as she and her young daughters started talking about ways to raise money to help children fighting cancer. 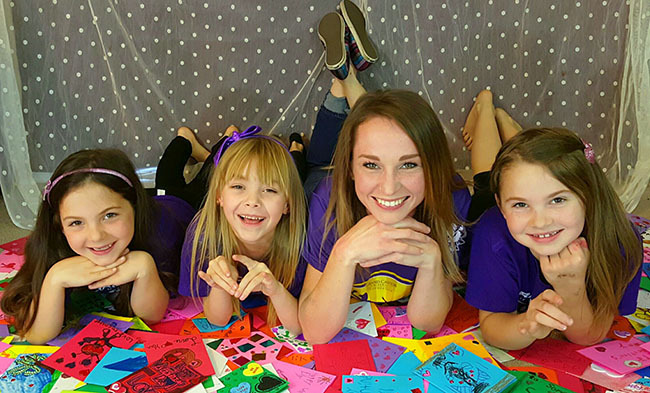 Rutherford, an enrollment counselor in the Tempe office of Grand Canyon University, came up with Cupids for Kids!, which will benefit the sixth annual GCU Foundation Run to Fight Children’s Cancer. Scheduled for Saturday, March 12, on the Phoenix campus, the run raises money to support Arizona-based Children’s Cancer Network and Phoenix Children’s Hospital. 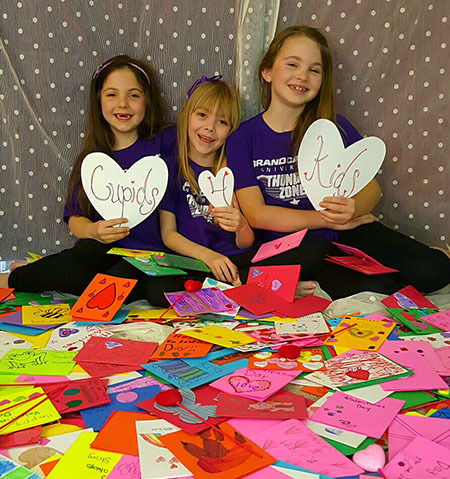 The Rutherford girls, along with their classmates at Pomeroy Elementary in Chandler, created the valentines, which will be available for a suggested donation of $5 each at Tuesday night’s men’s basketball game in GCU Arena. After learning that other children their ages are battling cancer, Rutherford’s daughters had a bigger idea – they would ask their classmates at Pomeroy Elementary in Chandler to help. The students got busy cutting, decorating and designing their cards with markers, hearts, rainbows, glitter and sweet messages to make each unique and special. Soon, Cupids for Kids! triggered a school-wide domino effect with 600 students sharing their love on paper. The valentines will be sold for a suggested donation of $5 each before Tuesday’s men’s basketball game, a 7 p.m. start against Benedictine University of Mesa in GCU Arena. There, Cupids for Kids! will have a table, and the cards, which are blank on the inside, may be personalized by their donors. An estimated 600 cards will be delivered on Sunday, Valentine’s Day, to patients and their families. The goal is to raise $3,000 and to surround the children with love and support from GCU, Rutherford said. “Valentine’s Day is a tradition that we all grew up having, but for a child in the hospital it might be the only card they get or maybe the only card they have ever gotten from another child their age because they’ve been stuck in the hospital for so long,” she said. Since the inaugural run in 2011, Run to Fight Children’s Cancer has raised nearly $400,000 to raise awareness of pediatric cancer, the leading cause of death by disease among children ages 14 and younger. The funds support research into promising diagnostic tools and cancer treatments and services for children and their families.